The Italian artist, Pietro Annigoni, worked with supreme skill in the old master tradition, as draughtsman, painter, engraver, and occasional sculptor. Among a broad range of subjects, including religious themes, he produced many self portraits, which charted his development and essayed his skills. Having decided, after the Second World War, that the British would be particularly sympathetic to his approach to art, he became world famous, in 1956, when he painted Queen Elizabeth II. Pietro Annigoni was born in Milan on 7 June 1910, the son of Ricciardo Annigoni, a mechanical engineer. He was educated at a local primary school, the Ginnasio Giuseppe Parini and the Collegio Calchi-Taeggi. When he moved with his family to Florence, in 1925, he attended the Collegio Padri Scolopi. At the same time, he attended classes in life drawing at the Circolo degli Artisti and at the Accademia di Belle Arti. In 1927, he entered the Accademia as a full-time student, and took courses in painting (under Felice Carena), sculpture (under Giuseppe Graziosi) and engraving (under Celestino Celestini). He based his style on Italian old masters, and learned from their techniques, while also receiving advice on oil tempera from the Russian artist, Nikolai Lokoff. Annigoni exhibited for the first time with two other artists, in Florence in 1930, at the Galleria Cavalensi e Botti. In the following year, he won the Domenico Trentacoste award. Then, in 1932, he held his first solo show at the Bellini Gallery in the Palazzo Ferroni, which attracted the attention of the artist, Giorgio de Chirico, and the art critic, Ugo Ojetti, who featured him in the arts section of Corriere della Sera. In 1935, he was given international exposure when selected to participate in the ‘Exposition d’Art Italien Moderne’ at the Jeu de Paume in Paris. A further exhibition at the Casa d’Artisti, in Milan, in 1936, brought him particular acclaim, and led to the important commission to produce frescoes in the Convent of San Marco, Florence. 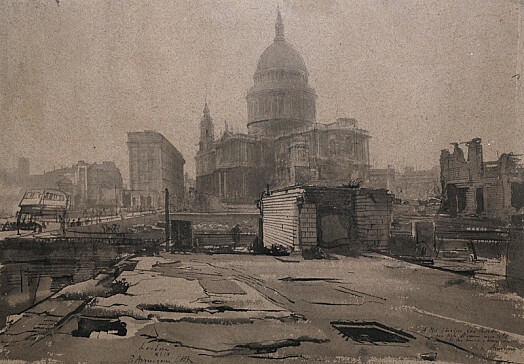 At the same time, he travelled widely, finding inspiration in the paintings that he studied, and producing a series of landscape watercolours. In 1937, he married Ann Giuseppa Maggini; they would have a son and a daughter. The open opposition of Annigoni to the fascism of Mussolini led to his ostracism from the cultural establishment within Italy until the end of the Second World War. But conditions so changed from 1945 that he was able to produce some of his greatest and most characteristic works. In 1947, he founded the Gruppo dei Pittori Moderni della Realtà, with six other painters, including Gregorio Sciltian and the brothers, Antonio and Xavier Bueno, and together they signed a manifesto. However, the group folded in 1949, and Annigoni was alone among its members to remain true both aesthetically and ethically to its opposition to abstraction. Late in the 1940s, Annigoni decided that the British public would be particularly sympathetic to his approach to art; and indeed, to an extent, he paralleled such Neo-Romantic contemporaries as Michael Ayrton. From 1949, he began to exhibit at the Royal Academy (showing a self portrait) and, in the following year, held the first of several successful solo shows in London (at Wildenstein), which led to international fame. Living in London for six months a year, he received many commissions, particularly for portraits, including several of members of the royal family, and was the subject of solo shows in Paris, New York, San Francisco and, of course, Italy. In 1954, the Fishmongers Company requested a portrait of Queen Elizabeth II, and the result proved phenomenally popular when it was exhibited in 1955 at the Royal Academy. While a second version, painted for the National Portrait Gallery in 1969, was less well received, Annigoni remained a prominent artistic personality through his later years. His first wife dying in 1969, he married Rosella Segreto, one of his favourite models, in 1976. During the late 1960s, he returned to religious works for various Italian churches, the most significant being those for the Abbey of Montecassino (1978- 80) and the Basilica del Sant’Antonio in Padua (1985). He died in Florence of kidney failure on 28 October 1988, having failed to recover from a perforated ulcer earlier in the year. A major retrospective took place in Florence, at the Palazzo Strozzi, in 2000. His work is represented in numerous public collections, including the National Portrait Gallery; the Museo Pietro Annigoni (Florence); and Indianapolis Museum of Art (IN).